The Post Falls Dam controls the depth of Lake Coeur d’Alene (8 ft. depth difference from low to high water) via an 11 miles stretch of Spokane River. The Posts Falls Dam was the erected on the Spokane river in 1906 to supply electricity and irrigation to the North Idaho area. This Dam is within the Post Falls Park. There are extensive trails, a pond, and boat launch behind the dam, and an overlook next to the dam. Boat traffic on this reservoir is not a problem during spring or fall, but during summer the traffic on this reservoir is best described as nuts! If you boat this reservoir in the summer follow all boating rules and practice very defensive boating. The reservoir is narrow and shallow in places but the main channel is deep enough for deep draft boats and keelboats. Boating on this reservoir from one end to the other and on into Lake Coeur d'Alene is an adventure. Kayakers, please see kayak route info below. Bridges and Power Lines: Two bridges cross the reservoir. HWY 95 Bridge crosses the reservoir/river on the east end and through Blackwell Island and on the west end. Spokane Avenue Bridge crosses the reservoir next to Q'emiln Park. At the Spokane Ave. On the bridge there is an electric sign (hanging over the river in boaters view - not in view from the street) indicating if the gates on the dam are open or not; open gates indicate greater current. Height clearance via the main channel when passing under the bridge is 20'-40' depending upon water level via the main channel. Power lines cross the Reservoir in at least 3 places (watch for more because as the area develops more lines may be put in) which can be an issue for sailboats. There are a bunch of power lines that cross near the Spokane Bridge. There is another set of lines east of the Green Ferry Launch (and widest part of the reservoir), and another one after that. INTERACTIVE GOOGLE MAP COMING SOON! PARKS & BOAT LAUNCHES: There are five nice parks on the reservoir. Below is a list of the reservoir/river access sites starting from the east end of the reservoir/river going west. ATTENTION... Lack of Accessibility: Accessibility to the water within the City limits of Coeur d'Alene, which includes North Idaho College is horrible. There was a large project underdevelopment to construct an accessible non-motorized marine launch but it was killed by many in this city. However they are spending millions on improving their city hall, which does not even improve accessibility to that building (sarcasm applied). So accessibility is not a high priority in this city. On a positive note there are several large parks within the city limits where much effort (a fight all the way) has created some level of accessibility in those parks. So if you are trying to access the water with your kayak, etc. and you have a disAbility that requires you to use a wheeled mobility device doing so within the City of Coeur d'Alene is not recommended. There is a boat launch within the city (#-- on the list) that is slightly accessible. Currently Blackwell Island (#-- in the list below) that is close to Lake Coeur d'Alene on the Spokane River is your best option to access the lake. Soon there will be a fully accessible non-motorized marine facility there. Currently Blackwell Island is the most accessible marine facility within Kootenai County. This park has several restroom facilities, running water, and picnic tables. 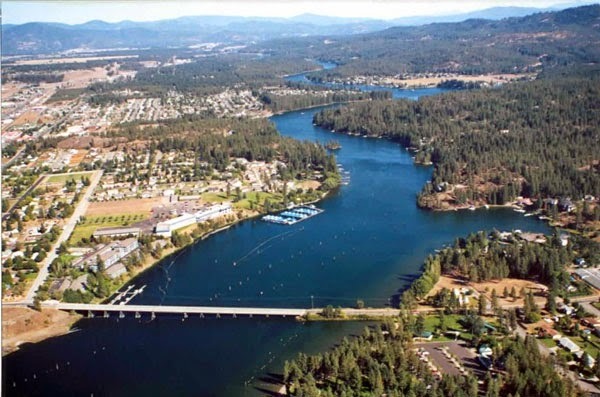 There is no boat launch but it is a popular spot for kayakers or small boat sailors to portage from the road to waters edge to access either the reservoir/river or Lake Coeur d'Alene. Directions: From I90 take exit 11. Turn south toward the City of Coeur d'Alene city center. On Northwest Boulevard follow the signs to North Idaho College, take W River Ave into the college campus. Follow this road through two round-abouts until you go up a slight hill where the road runs along the river and then the lake (also known by locals as Dike Rd.). This road goes around the outside of the college campus. Follow this road where the boats, dock, beach volleyball courts our, this is the place. Maps: To view a map go to www.google.com/maps, type in North Idaho College, W River Ave. ACCESSIBILITY: PARKING... Parking all along W River Ave. (dike rd) (no designated accessible and trailer parking). During the summer it's really hard to find parking unless you come early in the morning. We do not advise bring a trailer to this site; PATHS/TRAILS... There is a bike/pedastrian path right along the road which is part of the Centennial Trail. Where the boats, small building, beach volleyball courts are is gravel road down to a grassy bulkhead area, from this grassy area one can access the beach. There is not access path to the water; RESTROOMS/FACILITIES… One restroom up the road from the grassy bulkhead area via the Centennial Trail. There is a narrow paved path of about 5% grade down the the restroom. Restrooms are narrow and hard to get into but are accessible; SENSORY... No sensory tactile markers for those with visual and other impairments. DOCKS/LAUNCHES/PLATFORMS… One docks next to the grassy bulkhead. There is a large cement curb one as to get over to get onto the platform that gives you access to the gangway to the dock. Depending on lake levels the ramp can potentially have over an 8% grade, during the summer months its about a 6% grade. Due to the fact this dock is in a high boat traffic area the dock rocks a lot; DIRECT WATER ACCESS… No access for wheeled mobility devices; TRANSFER SYSTEMS... None; CAMPING... None; O.T.H.E.R… Oddities/Barriers: Lots of wave action; Terrain: W River Ave (Dike Rd) sits atop a large dike. This dike creates a steep incline to the beach; H2O/Water: Water in the lake is normally pretty clear until the powerboat season in the summer where sediment is turned up making the water murky. Water temperature in the summer can be around 70 degrees; Environmental Conditions: No issues other than lots of wave action in the summer; Resources: Food and gas in the town and in the summer at the concessions stand by the volleyball courts, which is not accessible to wheeled mobility devices/wheelchairs. This is the main boat launch on the east end of the Post Falls Reservoir/Spokane River, .4 miles down river of Lake Coeur d'Alene. This park has a large double ramp boat launch and extensive dock system, ADA boat access ramp/platform for person with disAbilities, restrooms, running water, picnic areas, accessible nature boardwalks through the marsh, and swim area within the non-motorized channel. The Island is separated from the mainland by a narrow channel... One can launch a kayak or canoe from the Island into the channel via several area along the channel bank. Several of these spots are from old primitive boat launches before the park was created. As you just enter the park to your left is where most of these old primitive launch sites are at (through the grass). For kayakers/non motorized craft launch from the low spots in the bank are preferred versus having to deal with powerboats at the launch. See more info about this channel, its landing, and other info by reading the info below in 2.5. 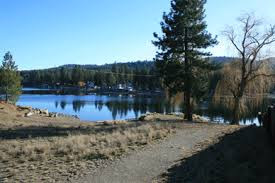 For information related to the Blackwell Island Park and boat launch, click here:http://www.blm.gov/id/st/en/fo/coeur_d_alene/recreation_sites_.html . Directions: From I90 take exit 11 off of I90. Turn south toward City of Coeur d'Alene city center on NW Boulevard. Turn right onto HWY 95 ramp. Turn left/north onto HWY 95 toward Moscow Idaho. After crossing the bridge that is right after getting onto the HWY, turn left immediately into the Blackwell Island park. Traveling north on HWY 95 from Moscow Idaho, turn into the Blackwell Island park before you cross the bridge that goes over the Spokane River. ATTENTION GOOD NEWS FOR KAYAKERS/CANOEIST'S! There will soon be a marine non-motorized launch into the channel that is on the back/south side of the Island. This new facility will have a dock with kayak launch system, transfer system for those with mobility issues, tactile system for the visually impaired, swimming access/wheelchair path into the water, etc. Info: There is a Blackwell Island RV Park right across the street from the boat launch http://www.idahorvpark.com/index.html . Directions: From I-90 take exit 11. Turn southeast toward the City of Coeur d'Alene city center. On Northwest Boulevard take the highway 95 on ramp and turn south toward Moscow Idaho. The entrance to the park is right after you cross the bridge. ACCESSIBILITY: Park is closed in the winter. Water level drops and there is no water at the docks/ramps, and channels, etc. PARKING... Parking lot is all paved, with many designated accessible and trailer parking; PATHS/TRAILS... Wide paths and sidewalks to and from the boat launch area and boardwalk. There is a large and fully accessible wood boardwalk through the beautiful marsh area at this Island that is home to many species of water foul. Currently there are no paths into the channel for swimming, but its under development; RESTROOMS/FACILITIES… Fully accessible restrooms. Accessible Picnic tables with pads. Sheltered Picnic areas; SENSORY... No sensory tactile markers for those with visual and other impairments. Its under development for the new non-motorized launch and swim area. DOCKS/LAUNCHES/PLATFORMS… Two large docks at the boat launch facility that are fully accessible. ramps grades are about 2%; DIRECT WATER ACCESS… No access for wheeled mobility devices yet. Underdevelopment; TRANSFER SYSTEMS... None. Under development; CAMPING... Right across the street is the accessible Blackwell Island RV Park (http://www.idahorvpark.com/index.html); O.T.H.E.R… Oddities/Barriers: Nothing unusual. Park is closed in the winter; Terrain: level to 3% grade tops; H2O/Water: Water in the river is normally pretty clear until the powerboat season in the summer where sediment is turned up making the water murky. Water temperature in the summer can be around 70 degrees. There is high currents during spring and fall; Environmental Conditions: No issues other than high currents during spring and fall. Lots of boat traffic on the north side of the park, but the channel that goes around the back side is quiet and a non-motorized area; Resources: Food and gas in town. ACCESSIBILITY: PARKING... Parking lot is paved, with about 10 vehicle spaces. No designated accessible and trailer parking; PATHS/TRAILS... Primitive dirt and gravel, rocky path starts out wide and then narrows and then is wide again where it ends at a wide flat grassy area; RESTROOMS/FACILITIES… Fully accessible restrooms at Blackwell Island Park; SENSORY... No sensory tactile markers for those with visual and other impairments. DOCKS/LAUNCHES/PLATFORMS… None; DIRECT WATER ACCESS… No access for wheeled mobility devices yet; TRANSFER SYSTEMS... None. Under development; CAMPING... Down the road at accessible Blackwell Island RV Park (http://www.idahorvpark.com/index.html); O.T.H.E.R… Oddities/Barriers: Nothing unusual. No water in channel in early spring, late fall, and winter; Terrain: level to 6% grade; H2O/Water: Water in the channel is usually clear, but water in river is normally pretty clear until the powerboat season in the summer where sediment is turned up making the water murky. Water temperature in the summer can be around 70 degrees. There is high currents during spring and fall in the river; Environmental Conditions: No issues other than high currents during spring and fall in river. Lots of boat traffic on the north side of the park, but the channel that you would launch into is quiet and a non-motorized area; Resources: Food, water, and gas in town. Johnson Mill River Park has a day use dock with swimming beach, shelter, restroom, water fountain, and paved parking area. One can easily carry a kayak or small craft from the parking lot to the beach/dock. Directions: From I90 from either exit 7 in Post Falls or exit 11 in Coeur d'Alene get onto E. Seltice Way. Coming from either Post Falls or Coeur d'Alene turn on E Seltice Way. Turn South onto Grand Mill Ln. Follow this road and turn right W Shoreview Ln. This road will to sharp to the left toward the river (if you turn left the at the sharp turn the road is W Riverway Pl and you are going the wrong way). After this sharp turn to the left you will be at the park. Address is 4340 W Shoreview Lane, Coeur d'Alene, ID. ACCESSIBILITY: PARKING... Parking lot is paved, with about 10 vehicle spaces. One designated accessible parking space and no trailer parking; PATHS/TRAILS... Paved path to dock and along parking area and grass; RESTROOMS/FACILITIES… Fully accessible restroom. One Sheltered Picnic area; SENSORY... No sensory tactile markers for those with visual and other impairments. DOCKS/LAUNCHES/PLATFORMS… One accessible L shaped dock; DIRECT WATER ACCESS… No access for wheeled mobility devices yet. Beach is sandy at about 5% grade; TRANSFER SYSTEMS... None. Under development; CAMPING... None; O.T.H.E.R… Oddities/Barriers: Nothing unusual. High currents during spring and falls; Terrain: level to about 5% grade; H2O/Water: Water in river is normally pretty clear until the powerboat season in the summer where sediment is turned up making the water murky. Water temperature in the summer can be around 70 degrees. There is high currents during spring and fall; Environmental Conditions: Normally very cold water and high currents during spring and fall. Lots of boat traffic during the summer; Resources: Food, water, and gas in town. ATTENTION this park is under development. The new park will includes paths, green open spaces, picnic areas, paved paths, paved parking lot, accessible dock, beach, and possible direct water access path. Ross Point Pump House Day Use Area is maintained by the Bureau of Land Management (BLM). Right now this site has a porta potty at the gravel parking area, one picnic table, and a trash receptacle. It currently has a nice beach to either swim and/or launch a kayak from; though the path to the beach is a bit long and rough. Directions: From I90 exit 7 turn east onto E Seltice Way. Turn left N Cedar Street. Turn Left onto Maplewood Ave. After you pass the street of S Riverside Harbor Dr., Maplewood will curve to the right, and right after the run curves to the right you will see a gravel parking area, this is the place. ACCESSIBILITY: PARKING... Parking lot gravel with lots of potholes; PATHS/TRAILS... None; RESTROOMS/FACILITIES… Portable restroom (some times is there and other times is not); SENSORY... No sensory tactile markers for those with visual and other impairments. DOCKS/LAUNCHES/PLATFORMS… None; DIRECT WATER ACCESS… No access for wheeled mobility devices. TRANSFER SYSTEMS... None. CAMPING... None; O.T.H.E.R… Oddities/Barriers: Nothing unusual. High currents during spring and falls; Terrain: level to about 5% grade on rough gravel and dirt; H2O/Water: Water in river is normally pretty clear until the powerboat season in the summer where sediment is turned up making the water murky. Water temperature in the summer can be around 70 degrees. There is high currents during spring and fall; Environmental Conditions: Normally very cold water and high currents during spring and fall. Lots of boat traffic during the summer; Resources: Food, water, and gas in town. This is the newest park on the reservoir/river and is leased to the city for $1 a year. The Kiwanis club sold part of their land at this site to afford to develop a 4-acre park. The park includes an swimming beach (no life guards), kayak/canoe launch area (have to portage a few hundred feet down a wide, level, gravel path), trails, picnic areas and shelters, restrooms, playground equipment, basketball area, and a 34x46 covered pavilion. This is a popular site for weddings and family reunions. Directions: From I90 exit 7 come to the intersection of S Ross Point Rd./ E Seltice Way. Go south on S. Ross Point Rd. Turn left onto E. Weatherby Ave. You will see a sign for the Kiwanis Park, turn right onto the park entrance road. Address is 4176 E. Weatherby Ave., Post Falls Idaho. ACCESSIBILITY: PARKING... Large parking lot; PATHS/TRAILS... Paths are all gravel and hard packed sand until you get close to the beach where the path can become soft; RESTROOMS/FACILITIES… Fully accessible restroom. One Sheltered Picnic area and other facilities at noted in text above; SENSORY... No sensory tactile markers for those with visual and other impairments. DOCKS/LAUNCHES/PLATFORMS… None; DIRECT WATER ACCESS… No access for wheeled mobility devices yet. Beach is sandy at about 5% grade; TRANSFER SYSTEMS... None; CAMPING... None; O.T.H.E.R… Oddities/Barriers: Nothing unusual. Lots of sand; Terrain: level to about 5% grade; H2O/Water: Water in river is normally pretty clear until the powerboat season in the summer where sediment is turned up making the water murky. Water temperature in the summer can be around 70 degrees. There is high currents during spring and fall; Environmental Conditions: Normally very cold water and high currents during spring and fall. Lots of boat traffic during the summer; Resources: Food, water, and gas in town. We took a picture of the launch when the water in the reservoir was drawn down to show how shallow this launch site is. When the water level is at its highest the depth at the end of this gravel launch is only about 4 feet deep or less. This launch facility is not well suited as a swim area due to the very short shore area and boat traffic. It also has no restroom or running water. However, this is a great place to launch from in order to access the widest part of the reservoir. There is a sand/mud bar you could potentially go aground on if you were to proceed west from the mouth of the channel. It is best to follow the north shore of the channel all the way out until your are heading directly north directly into the river channel. If you sail on this portion of the reservoir going east a short distance there are power lines (very high off the water but still something to watch for). Also up river (west) there is another set of power lines. They are fairly high off the water. Sorry we have no measurements. Directions: From I90 exit 5 turn south onto N Spokane Street. Turn left W Riverview Dr. Almost directly across from the boat launch is W Bel Air Rd. It can be easy to pass this launch as the launch sigh is small. You have gone to far if you come to cross street of S. Greensferry Rd. ACCESSIBILITY: PARKING... Gravel and mud parking lot; PATHS/TRAILS... None; RESTROOMS/FACILITIES… None; SENSORY... No sensory tactile markers for those with visual and other impairments. DOCKS/LAUNCHES/PLATFORMS… None; DIRECT WATER ACCESS… No access for wheeled mobility devices; TRANSFER SYSTEMS... None; CAMPING... None; O.T.H.E.R… Oddities/Barriers: Nothing unusual. Sand and mud; Terrain: level to about 3% grade; H2O/Water: No water at this launch during early spring, late fall, and winter. Water in river is normally pretty clear until the powerboat season in the summer where sediment is turned up making the water murky. Water temperature in the summer can be around 70 degrees. There is high currents during spring and fall in the main channel; Environmental Conditions: Normally very cold water and high currents during spring and fall. Lots of boat traffic during the summer; Resources: Food, water, and gas in town. There is no boat launch here but If you are boating with a sail yak or even a small dinghy you can walk your boat down the trail several hundred feet to the water (watch out for bikes). Amenities include restrooms, running water, paved bike/hiking trails, swim area, and large parking area. Directions: From I90 exit 6 turn south onto E Seltice Way. A short distance from the Interstate Turn Right onto N Bay Street. Stay on this road all the way to the park. N Bay Street crosses N 3rd Ave. ACCESSIBILITY: PARKING... Large paved parking lot; PATHS/TRAILS... There are paved bike/pedestrian paths, none of which give direct access to the water. RESTROOMS/FACILITIES… Fully accessible restroom. One picnic area and swim area in the bay that is off limits to powerboats; SENSORY... No sensory tactile markers for those with visual and other impairments. DOCKS/LAUNCHES/PLATFORMS… None; DIRECT WATER ACCESS… No access for wheeled mobility devices yet. Beach is sandy at about 5% plus grade; TRANSFER SYSTEMS... None; CAMPING... None; O.T.H.E.R… Oddities/Barriers: Nothing unusual. Lots of sand; Terrain: level to about 5% grade; H2O/Water: Water in river is normally pretty clear until the powerboat season in the summer where sediment is turned up making the water murky. Water temperature in the summer can be around 70 degrees and even warmer in the bay. There is high currents during spring and fall in the river; Environmental Conditions: Normally very cold water and high currents during spring and fall in the river. Lots of boat traffic during the summer in the river; Resources: Food, water, and gas in town. This is the largest park on the reservoir (this section of the river) with fenced in swim area, restrooms, running water, playground, hiking trails, and 2 large paved boat launches with 3 docks. There is a fee to use this park. For more information log onto www.postfallsidaho.org . Note of caution - If you are launching from Q’emiln Park be aware of the current as you could be drawn into the dam barrier. The current can be very fast (particularly during spring). Post Falls Chamber of Commerce website: www.postfallsidaho.org. 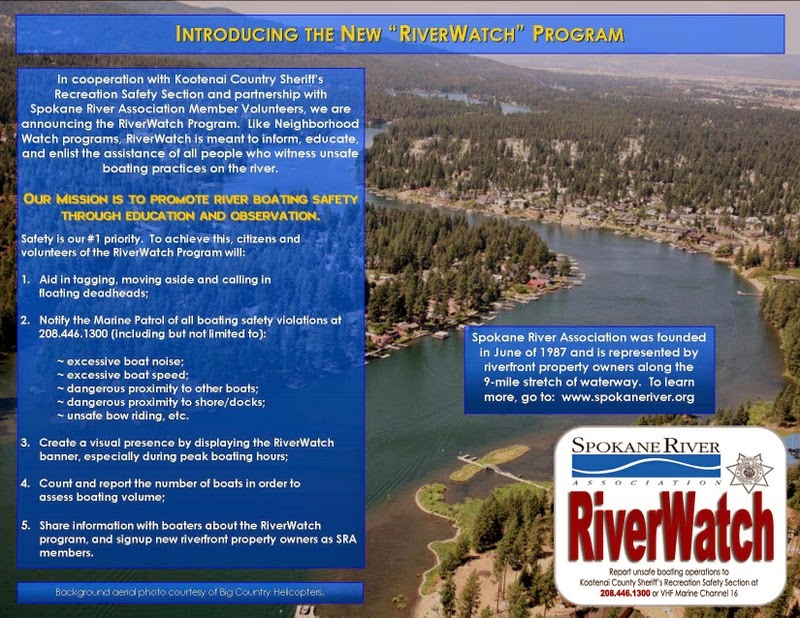 Call 208-769-1357 or log onto www.avistautilities.com/environment/ourpart/recreation for more information. Directions: From I90 heading from either Spokane or Coeur d’Alene - Take Exit 5 and turn right (south); cross the bridge and to the left you will see the park. Directions: From I90 exit 5 turn south onto N Spokane Street. Follow this street across the bridge. Turn Righ onto W Parkyway Dr. Follow signs into park and/or to boat launch. ACCESSIBILITY: PARKING... Large paved parking lots; PATHS/TRAILS... Large paved parking lot give access to launch docks. There are paved paths into the park areas. The beach is all sand. At low water there is mud also. Park includes many hiking trails, all of which unfortunately are not accessible to wheeled mobility devices; RESTROOMS/FACILITIES… Fully accessible restroom in park area. Picnic areas, playground, etc. as noted in text above; SENSORY... No sensory tactile markers for those with visual and other impairments. DOCKS/LAUNCHES/PLATFORMS… 3 accessible docks, 2 docks have fingers where boats can park for the day (no over night mooring. Also has for spots with jetski dry docks. One dock is next to a grassy area and beach, which is idea for non motorized craft to beach at (no accessible paths into the water); DIRECT WATER ACCESS… No access for wheeled mobility devices. Beach is long and fairly close to paths and grassy areas, with assistance some individuals with mobility issues could get into the water. Beach and boat launches are not more than about 3-4% grade; TRANSFER SYSTEMS... None; CAMPING... None; O.T.H.E.R… Oddities/Barriers: Nothing unusual. Lots of sand; Terrain: level to about 4% grade in launch and park area; H2O/Water: Water in river is normally pretty clear until the powerboat season in the summer where sediment is turned up making the water murky. Water temperature in the summer can be around 70 degrees. There is extreme currents during spring and fall, and when dam is opened up. CAUTION, stay way from the dam boundary markers. Stay near the beach until you head up river past the dam; Environmental Conditions: Normally very cold water and high currents during spring and fall. Lots of boat traffic during the summer; Resources: Food, water, and gas in town. Drinking water is available in the park during the summer. Some food concessions are available in the park, particularly during the several festivals at the park. We will have an interactive Google map to go along with this Island info shortly. Islands: There are 7 main Islands within the Post Falls Reservoir of the Spokane River as well as two more very small unnamed islands. Going from where the Spokane River starts at Lake Coeur d'Alene to Post Falls (westerly direction) are Blackwell Island and Little Blackwell Island. These are the only Islands on the river that the public is allowed to access. When the reservoir/river is drawn down, the channel between these two Islands disappears and the Islands become one and connects with the mainland. The channel is a nice place to swim and kayak from. When there is water in this channel it is for non-motorized use only. Amenities include a park with double boat launch and docks, restrooms, picnic areas, nature trail boardwalk, and shelters. There is one marina, a privately owned campground, and the famous floating restaurant, Cedars. See number #2 at the beginning of this page. The next Island is Marsh Island. No power boat traffic is allowed to go behind the Island due to the wildlife restrictions. One can access this area to view water foul via kayaks by launching across the river at Johnson Mill River Park. A short distance up river is Hidden Island. It is privately owned and has a channel that dead ends due to a low bridge, which even a kayak can't go under. The second largest Island on the reservoir/river is Harbor Island, which, like the other Islands, also has a channel that is accessible from the reservoir/river. This channel has privately owned docks along its length but is not a channel that non-resident power boaters use as it is in a no wake zone and dead ends at the bridge. At east entrance to this channel is a sign that says "dead end." However, this doesn't apply to those in kayaks or canoes which can easily pass under the bridge. This is a beautiful place to paddle and a nice way to get out of reservoir/river traffic. There are two designated wildlife Island(s) on this reservoir/river - the Twin Goose Islands. This is one Island in the winter when the reservoir is drawn down, and two Islands in the summer when the reservoir is full. Location is about 1 mile east of the dam. These twin Islands are waterfowl habitat so are not to be accessed by people. The final Island is Span Way Island, a privately owned island with houses on it. Span Way is just a short distance up the river from Q'emiln Park and on the same side of the river (south side). There is a channel around the island but where the street crosses to the Island there is a pipe that passes under creating an impassable barrier that even a swimmer couldn't get through. The channel on either side of this road is private and used by the owners of the homes along the channel for their watercraft. Bays: There are several bays and inlets that seem to be ideal locations to get away from the main channel of the reservoir. Black Bay (See Black Bay Park #8) is a perfect bay to get away from the boating traffic, particularly if you are on a kayak or non-motorized vessel. This bay is part of the park ran by the city of Post Falls. Going into the bay a short distance you can anchor your power boat and relax. The bay is a button hook shape and half way into the bay there are signs prohibiting motorized vessels. It's quite a nice place go to kayak and especially swim. Ross Point Bay is another nice anchoring spot. It is surrounded by a Church Camp so you will want to be mindful of what you do, and if you are listening to music please keep the volume down when in this bay. The land around this bay is owned by the Baptist church so the general public is not allowed to go on shore. There are several other inlets/coves; Hidden Cove is across from Ross Point Bay. But like the other small inlets, it is surrounded by homes and is really too small to anchor in without impeding boat traffic from those homes. The public boat launch among these inlets is the Greens Ferry Public (#7) Boat Launch; there is a narrow channel leading to and from this launch facility. The channel was created primarily by Cedar Creek and the increased water level from the dam. There is no water in this channel during the winter and it is only 2-4 feet deep during the summer. This channel can be busy due to boats leaving from and returning to the boat launch and private residences, so is not a channel to anchor in or obstruct. Just west of the channel is a mud flat so stay clear of it or you may go aground. Shahadat hussain, November 26, 2013 at 9:29 AM: What a beautiful scenery.Q'emiln Park and Boat Launches is the most wonderful place.